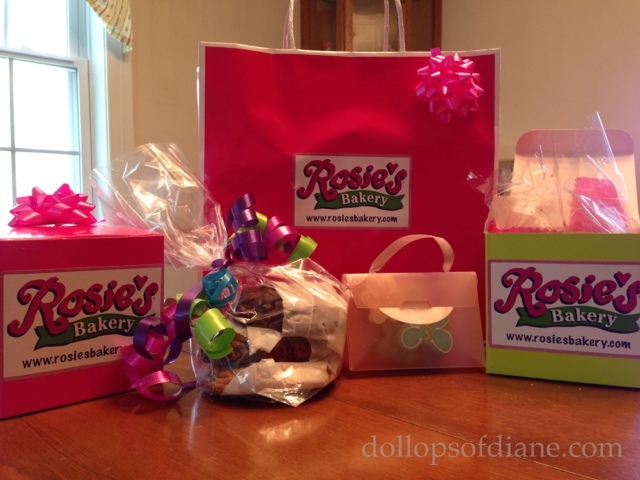 Dollops of Diane: Rosie's Bakery - Yum! 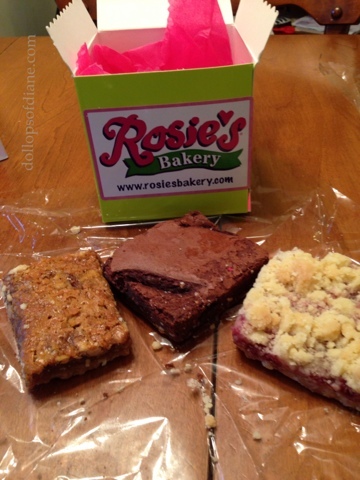 Treats from Rosie's Bakery! The wonderful people at Rosie's were nice enough to send me some of their delicious menu items to sample. My package contained fudge swirl brownies, walnut dream bars, raspberry crumb bars, butter cookies, apricot rugulah, a Soho Glob cookie, an oatmeal raisin cookie, and a chocolate chip cookie. On top of that we got to try a Snow Queen cupcake and received a little pink pocketbook filled with glazed sugar cookies. I'll give you a minute to wipe the drool off your mouth. Everything (yes, I sampled everything!) was delicious. If I had to pick favorites I would say the raspberry crumb bar and the walnut dream bar were on the top of my list. 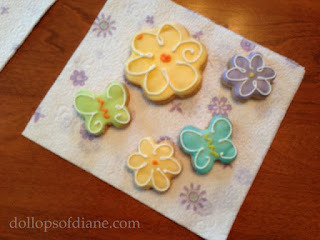 The kids also loved the glazed sugar cookies. And how cute are they? Rosie's is offering up all kinds of special treats for Mother's Day so if you're not sure what to get a special mom in your life you might want to check them out. Oh, and while you're at one of their locations, be sure to grab a bar (or ten) for yourself!